Be dazzled by glittering gems and one-of-a-kind treasures at the Diamond Museum Amsterdam! Follow the journey of the world’s most coveted stones from deep inside the earth to settings on royal crowns and valuable works of wearable art. 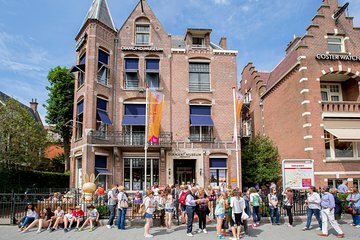 Browse glittering, diamond-encrusted displays and learn about the long history of the diamond trade in the Netherlands. You can even watch professional stone polishers and goldsmiths at work creating modern, high-carat masterpieces. See the most beautiful diamond artifacts and the smallest diamond ever cut! This is an informative museum and in great location but it is not a must see in amsterdam. Sorry I just didn't go on this tour our plane was delayed and we just didn't have time to do all the tours I booked in Amsterdam.